If you suspect that your basil plants have been affected by basil downy mildew, what do you do next? Basil downy mildew is a highly contagious disease and can come with little warning. It is transmitted through spores that are nearly invisible to the naked eye and can be blown in on the wind; carried in on clothing, hands, or tools; or travel on the water that's splashed or sprayed from plant to plant. 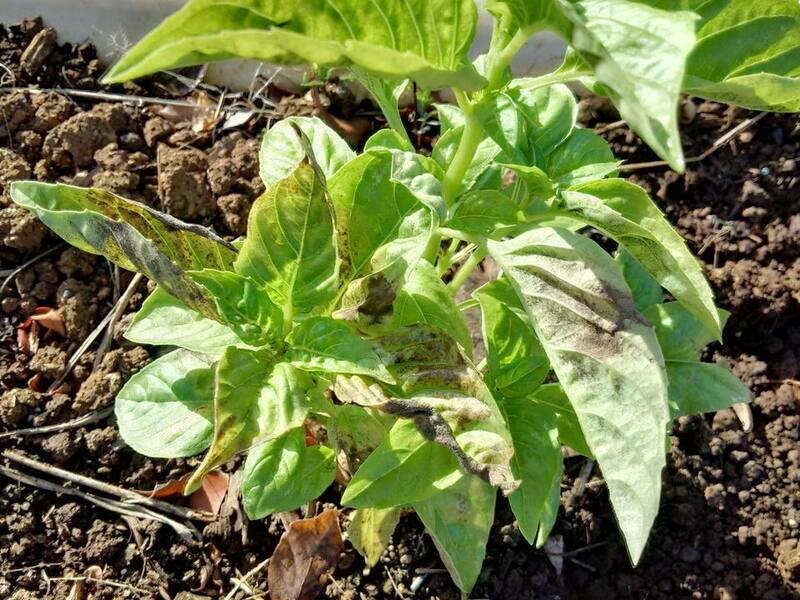 Here are some things you can do after you find basil downy mildew in your garden as well as some answers to common questions about basil downy mildew. What Does Basil Downy Mildew Look Like? Basil downy mildew is caused by a pathogen called Peronospora belbahrii. Basil that has become infected with downy mildew may have a yellowish appearance, similar to a nutritional problem. Yellowing typically first appears in areas along major veins and eventually spreads throughout the leaf. Infected leaves also can show irregular black spots as well as gray, fuzzy spores on the underside of the leaf. As the disease advances, the leaves turn completely yellow and fall off, the stems wither, and the plant eventually dies. The infection usually begins lower on the plant and moves upward. If you suspect your plants are infected with basil downy mildew and would like an expert diagnosis, you can bring an affected leaf to your local county or university extension office for positive identification. Carefully pinch off a leaf and place it in a sealed plastic baggie for transport. Once you are certain that your plant has downy mildew, cover the entire plant with a bag to prevent the spores from spreading—remember, they can become airborne and land on other plants, or they can fall and contaminate the soil. After bagging, pull up the entire plant, remove it from the garden area, and destroy it. Do not compost the plant or try to remove only the visibly affected leaves. Both of these techniques can result in spreading the spores. Also, do not save your basil seeds from any part of that year's crop. The spores can infect the seeds and affect the following year's plants. Basil downy mildew thrives in warm, moist conditions. It can grow in temperatures as low as 59 F but is more prevalent at higher temperatures, especially in humid conditions. This is why the problem tends to be most severe in late summer in many climates. The best way to prevent downy mildew or to limit its spread is to space your plants far enough apart so their leaves can dry between waterings or after rain. Drip irrigation is preferable to spraying because the leaves stay dry with drip. If you must spray, water the plants more deeply and less often, preferably early in the morning so that plants have plenty of time to dry during the day and between waterings. Will Downy Mildew Stay in My Soil? Basil downy mildew can stay viable for many years in the soil, with some reports indicating that spores can stay viable for eight years or more. To play it safe, it's a good idea to rotate your crop of basil and plant in an entirely new location for the next season. Generally speaking, basil leaves infected with downy mildew are not poisonous, but it is not advisable to eat leaves that are clearly affected. When you first notice signs of the mildew, it is best to remove the entire plant and remove and cook only the healthy leaves, if you want to eat them. Because basil grows so fast, quick removal and starting new plants in a new location is the best way to prevent spreading the mildew spores.